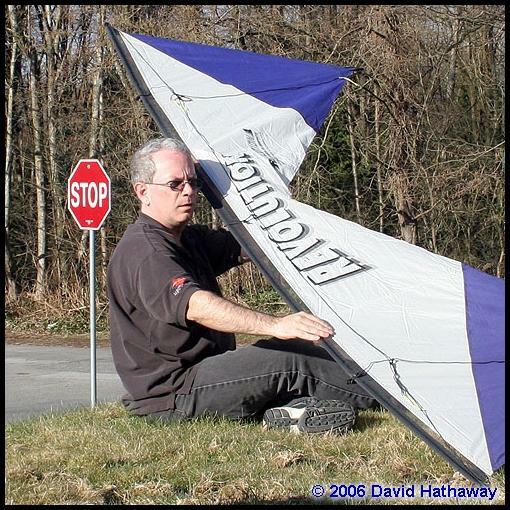 Many years ago, when I first picked up a kite, there were a few magazines that were published on a regular basis. 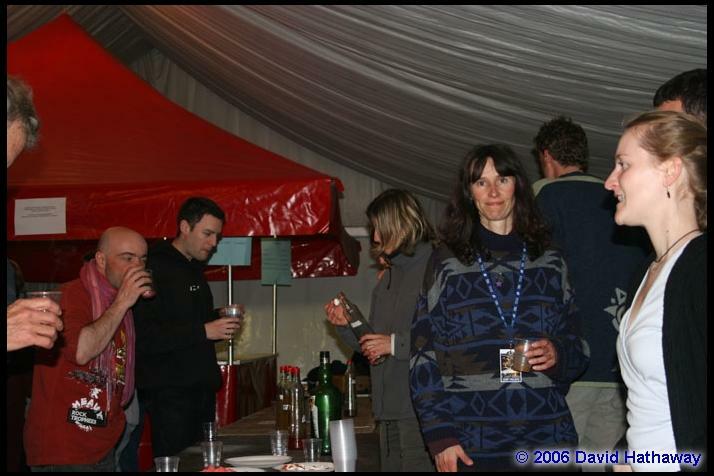 A few things caught my eye in those days, mainly festival reports on the “large” festivals, and any article on Revolutions. 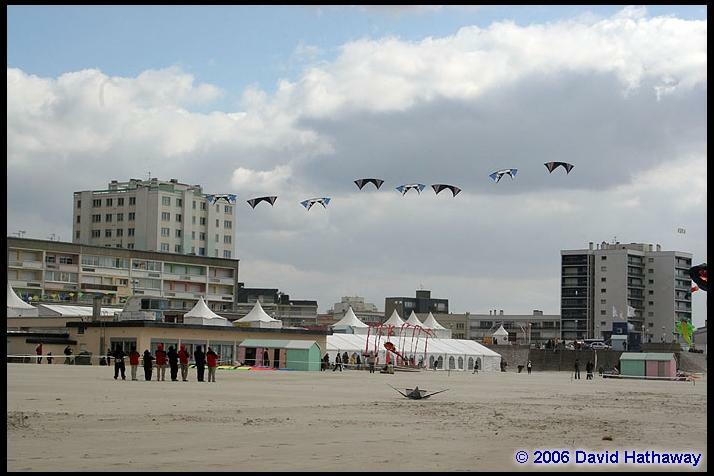 I remember at that point reading all about the annual Berck-Sur-Mer festival and thinking I’d love to go to it one day, and I also read an article on The Decorators, one of the original quad kite teams, based in England. 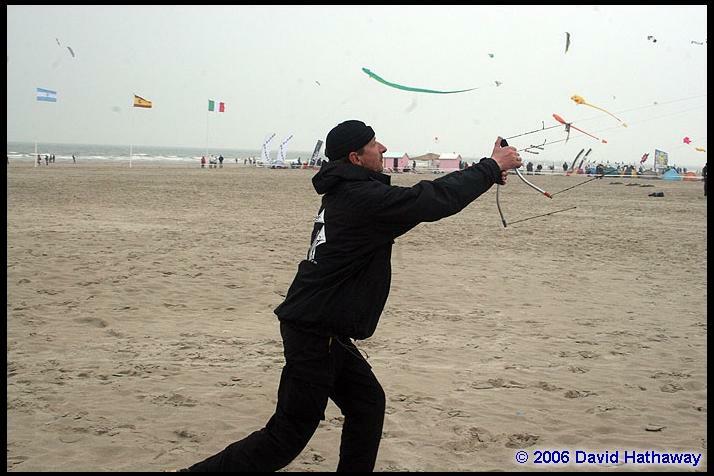 “One day… I’ll somehow manage to see both of these things…” Last fall, John Barresi and I were talking and he’d mentioned he was heading to Berck to act as a judge for the World Sport Kite Championships. I jokingly suggested I’d join him, and do pictures for Kitelife while he was judging. As the winter wore on, the idea of heading to France for some flying never left my mind and finally, piece by piece, the plan came together and I was set to go! 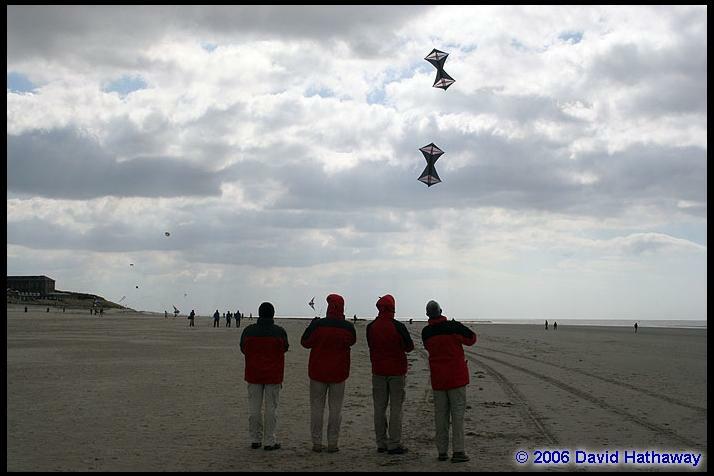 While the “surface” reason for heading to Berck was to act as photomonkey/writer for the Kitelife daily updates, the real reason in my heart was to take in some Rev team flying, something I had always wanted to experience, thanks to The Decorators whetting my appetite, but, it was something that hadn’t been seen in any big way in North America in many years. 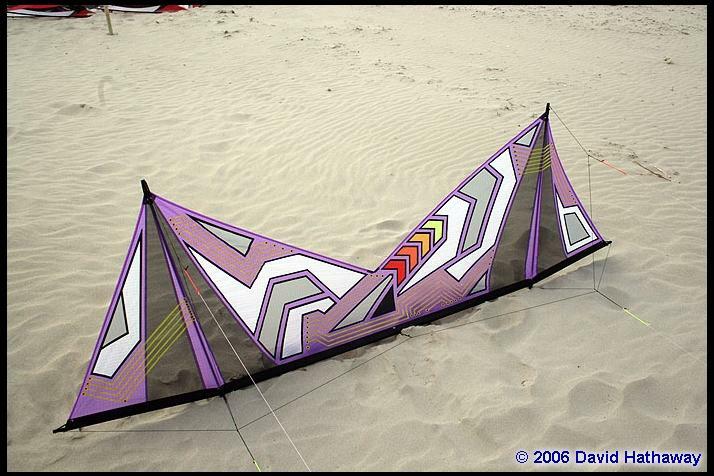 I think the last trip to the West Coast for The Decorators was 1996 to WSIKF and I hadn’t managed to get out to the now defunct Kites on Ice festivals in Wisconsin. As the trip got closer, I’d managed to establish a point of contact with all of the teams that were going, FLIC and Crazy Drivers from France, England’s The Flying Squad and Germany’s Team 4 Fun and I was well prepared to enjoy watching a lot of flying. 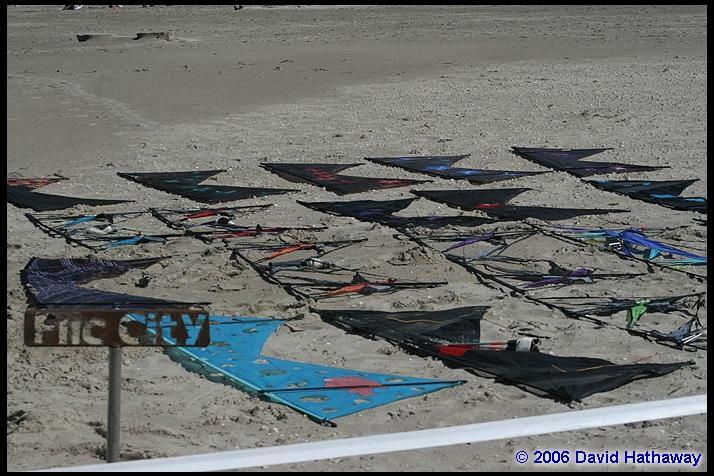 I packed carefully as well, taking what in the end managed to be too many kites, but, you know, you can never have too many… I took 5 Rev 1s and 6 1.5s as well, and I had a 120 foot line set cut for me by The Kite Shoppe as all of the people I talked to stated that this was the “standard” line set for teams in Europe. With the addition of a new camera, a French phrasebook and a fresh passport, I was ready for the trip! The “getting there” part would have been excruciating had I not been so excited in general to go, from the time I woke up in Vancouver, BC until the time I put my head to a pillow in Berck was close to 36 hours and I’m one of those people who can not sleep on an airplane. So, yes, it was a pretty long day from start to finish, but, somehow I managed to survive this with very little jet lag. Again, I think was entirely based on the sheer excitement of making the trip. 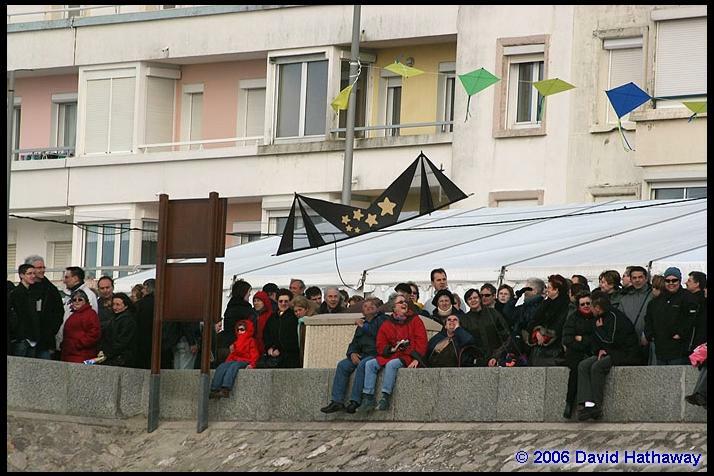 I was met at the Charles De Gaulle Airport by John and the rest of the people from the US, who all piled onto a bus to make the trip to the coast, which was about 3 hours away. I did try to grab a nap during this but I was having too much fun chattering away with everyone. Once we arrived, I got a good look at the beach itself, while the tide was out and, it’s huge! I’ve been to Long Beach, Washington many times for the WSIKF festival and that’s a pretty deep beach but, when the tide is out in Berck, the beach is at least a 1/4 mile deep, if not 1/2 a mile and covered in nice fine sand. After some food and drink, it was finally time to call it a night, 1000s of miles from where I had woken up. 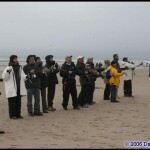 I’ll avoid doing a complete “day by day” of the entire event, just to keep the article length somewhat manageable, but, I will say that from the very first Saturday when I stepped down onto the beach, the European Rev flyers I met were nothing but welcoming and helpful the entire time. 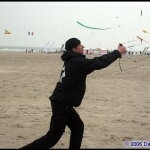 My first contact was with Hans of Team 4 Fun, from Germany. 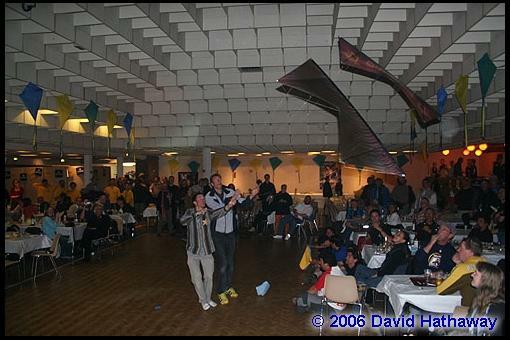 We’d exchanged a few emails before my arrival and this was the first team I ran across, with members of France’s Crazy Drivers and some other friends of theirs from Holland also playing. I was hooked immediately, watching them move their Revs through the various maneuvers and the best part was I was also immediately invited to join in! Off I scrambled to get the right length of lines and I simply dove right in, with John joining us a few minutes later. 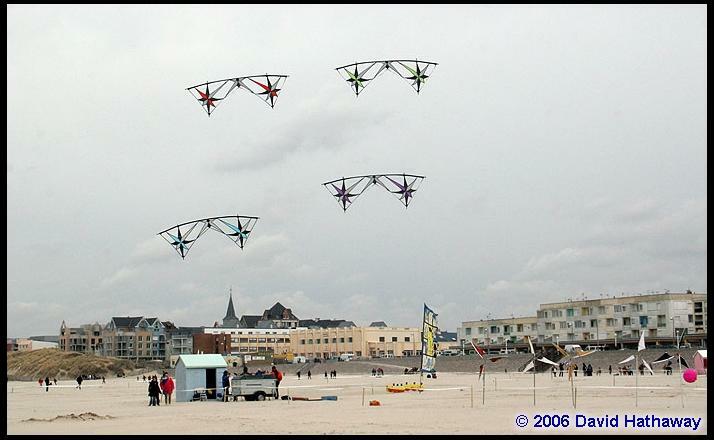 At first glance, “rev team” flying looks deceptively simple. There are few sudden moves and it’s done at a leisurely pace for the most part. 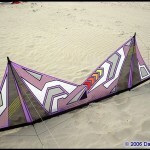 However, make no mistake about it, it’s quite a bit tougher than it looks, for the same reasons it looks simple. You really have to be able to move very slowly, and very precisely and with a watchful eye open for what’s happening around you. 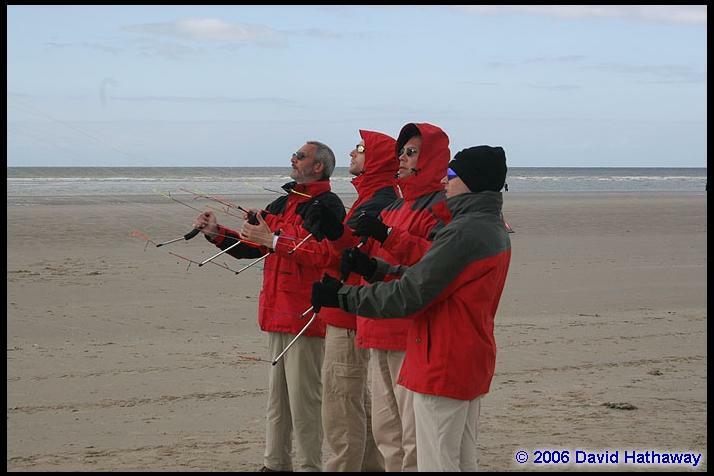 Wherever you are within the group, who is to your left and to your right becomes very important as you constantly need to ensure your distance remains even with them, and your speed matches the rest of the kites involved in the movement. 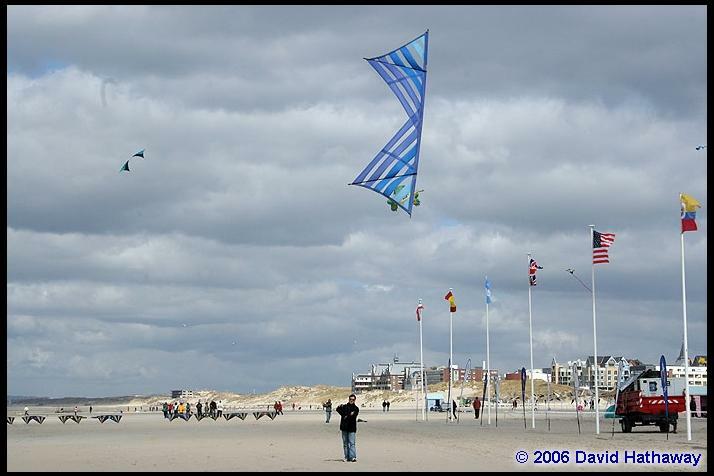 Even with a basic “ok, follow me” figure 8’ish move, your speed needs to remain in line with whoever is in front of you and the kite behind you. 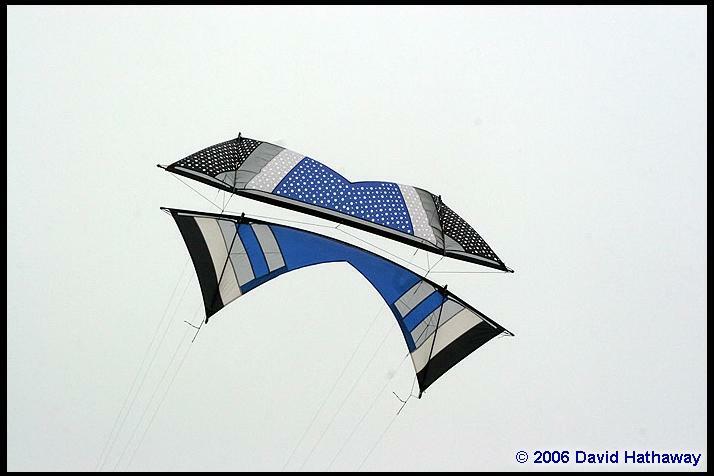 At first, I found it very tricky to wrap my mind around this, as I’d spent the better part of 10 years flying solo without worrying about such things, I’d race around at whatever speed I wanted, stopping, starting and (as I quickly discovered…) performing some pretty sloppy turns. However, spend a couple of hours with a team of experienced flyers chasing you around and I can guarantee they will beat these bad habits out of you. Gently. For the most part. All of the teams I worked with while I was there were gracious and patient about this learning curve, and really, all it takes is some focus. I tried to avoid watching the spectacle of all the kites involved, focusing in more onto who was beside me on either side, this tended to help a lot. Both John and I simply had the best time getting this under our belts and we managed to somehow not pull everyone out of the sky. Oh right, one further “thing” you’ll get used to, crossed lines and the pressure that comes with that. 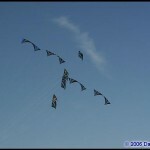 Picture this, you are in a line of 8 flyers, and the kites are reversed, ie, if I was far left, and my kite was far right. 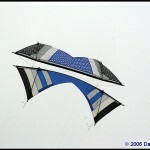 As you go into the turn to come back, your lines are suddenly meshed in with the 7 other flyers lines. 32 separate pieces of line grinding together until you have wound your way back. 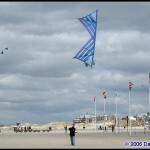 It was really unnerving at first to keep the kite under control, but, again, you do get used to it pretty quickly. And, pretty quickly it was, as after about an hour or so of flying with Team 4 Fun, Hans announces we’re headed into the main demo field to do a demo. 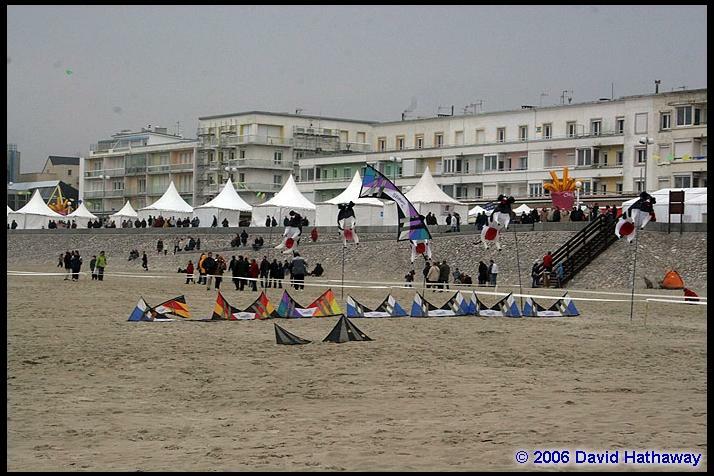 Uh… In John’s article elsewhere in this issue, you’ll get a sense of the sheer size of the crowds on the weekends at Berck, but I’ll tell you there was probably 100,000 sets of eyes on this field. Talk about your massive audience! But, it was a case of now or never and I’m not one to easily back down from a challenge, so off we went, with me dearly hoping I wasn’t about to become a big liability and pull everyone else down at once. And in the end? It was fine. 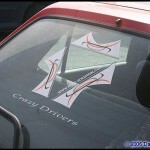 No catastrophes, crashes or even real nervousness. I had wanted to fly under such an arrangement for so long, I just went with it and emerged afterwards with a smile that was a mile wide and really in need of a drink. 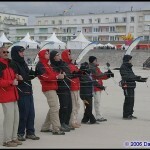 The largest group of flyers was FLIC (Four Line International Club), also from France. In numbers ranging from 4 to 9 and usually with 8 flyers at any one time, you could see them flying nearly all day long (and even during the night fly!) for the entire 10 days of the festival. 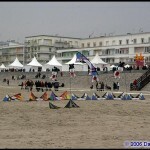 I talked with Seb quite a few times during the week and he commented that when they first started coming to Berck about 5 years ago, it was always a struggle for any of them to leave and go back to work during the weekday days and as the years went on, they simply arranged to stay for the entire 10 days. I spent a lot of time watching these people work on their routines, they were simply beautiful to watch and full of some very intricate patterns. 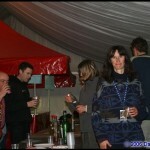 They also held a tremendously amusing party one night in the VIP tent, complete with music and some of their very special FLIC drinks. 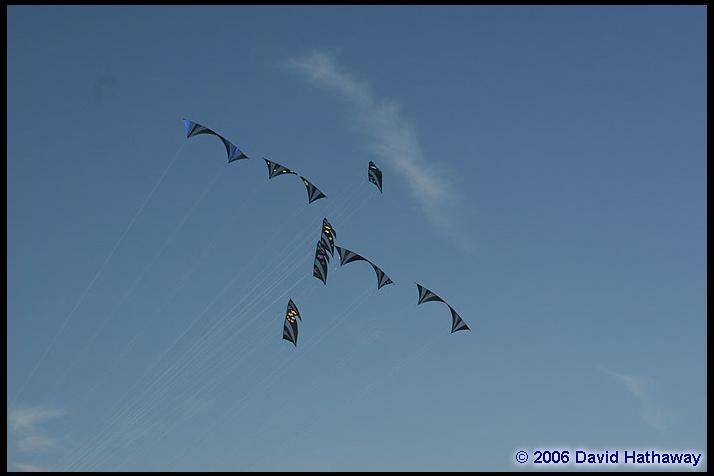 During the weekends, a local dance troupe put on various performances to music during the day and they were usually accompanied by at least FLIC and usually the Flying Squad and Team 4 Fun as well, providing upwards of 12 – 16 kites moving around while the dancers did their performance. 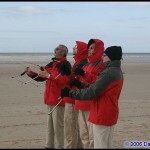 FLIC reminded me of some kind of band of kite gypsies, working their magic as much as they could, whenever they could. Truly a talented bunch of individuals and I’m vowing to spend more time with them the next time I am back that way. 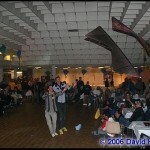 Also noteworthy was Seb and Phillipe’s stunning indoor flying display they put on at the final banquet. 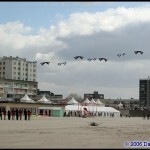 There are some picture below but, I don’t feel they properly convey how exciting the flying was. A very small space, that was very crowded with people and yet they made it work. This was one time I’d really regretted leaving the video camera back in the hotel, but, as it was my 42nd birthday that evening, I was traveling light for a change. I’ve seen a fair amount of indoor flying over the years but, I’m tempted to say that this was the best display of it I’ve ever seen. Well done guys, it’s a memory that will stay with me for life. 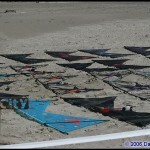 Most of the middle of the 10 days was taken up by the World Sport Kite Championships as I ran around with a camera and camcorder, capturing the teams as they worked through the 4 days of competition and I didn’t get in as much Rev flying as I would have liked, but, given that’s the primary reason I went, I didn’t feel badly about this. 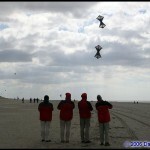 It was a lot of fun and I’m a diehard fan of team flying, whether its duals or quads. 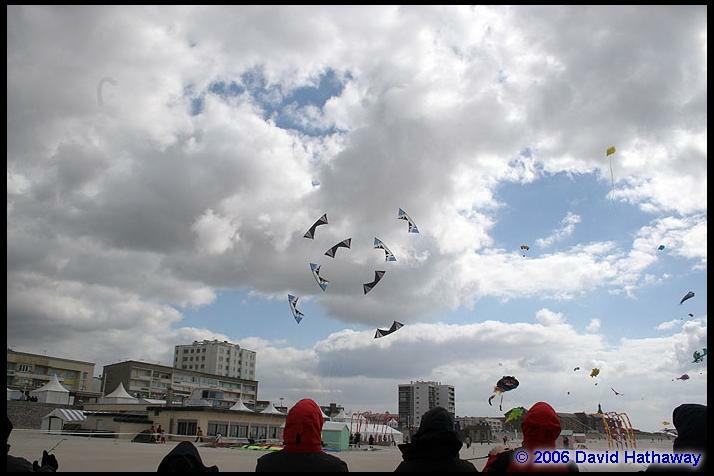 In my eyes, it’s the most exciting kite flying you’ll ever witness. However, once this had wrapped up (with Cutting Edge emerging victorious again!) it was back to Rev flying for me. 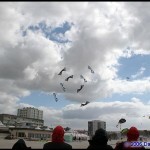 Much of the last weekend was spent with England’s team, The Flying Squad. A really great bunch of people to fly with and for a change, I wasn’t having to decipher calls back to English! The time spent flying with them further honed my ability to stay out of trouble and I’m really grateful for their patience and teaching, thanks again to Steve, Steve, Matt and Lisa! 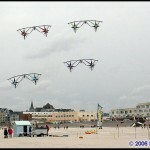 But, the biggest event of the weekend was the Rev Mega Fly. 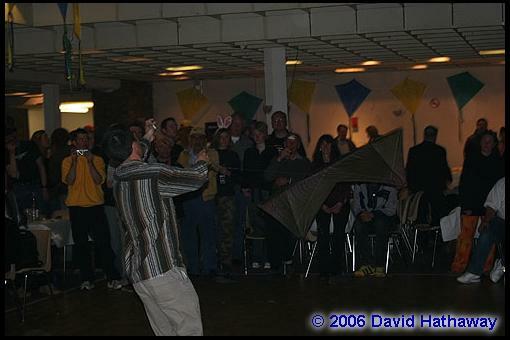 We’d been talking about this before we left and the entire week leading up to it and finally, we ended up with 18 flyers in the air at once, comprised of The Flying Squad, FLIC, Crazy Drivers, myself, John Barresi and Wayne Fu of Airzone. 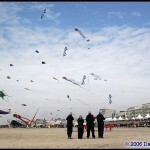 Nothing could possibly prepare you for this amount of people and kites, and lines. If you look at the videos (one 23 minute one in the Kitelife subscribers section, and a shorter one included with this article) you can get a feel for the madness involved but, again, it was remarkably trouble free. 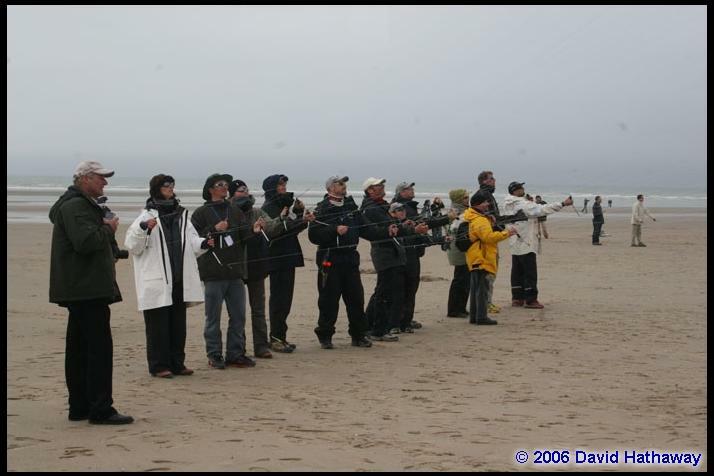 FLIC supplied a person equipped with a bullhorn, and with Steven Hoath acting as a translator, off we went into the sky, all 18 kites, 36 handles and 72 lengths of 120 foot line. I can tell you without a doubt, and I know John felt this way as well, it was the best experience of my flying life. It was a deeply moving experience that found me often bursting out with laughter at the fun of it. 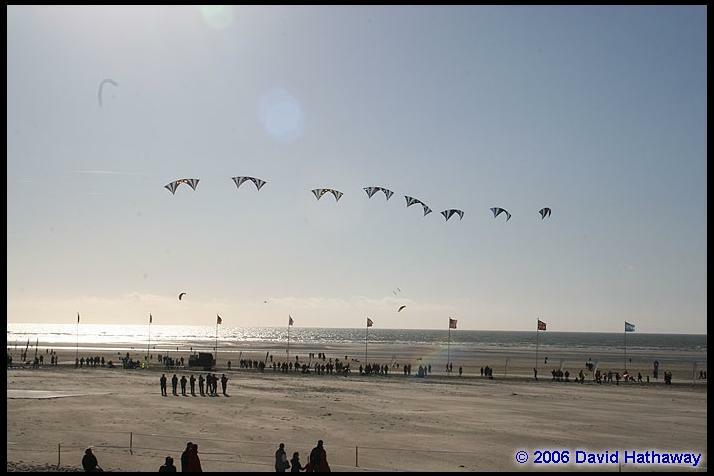 As it was the 20 year anniversary of the Berck festival, we had decided in advance to literally write out “20” in the sky. 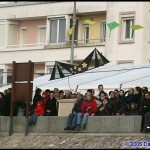 As the kites moved into position, we’d hold this, and then burst it out, much to the glee of the assembled crowd watching. 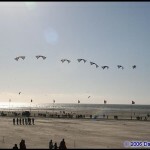 We then reversed the formation so that people downwind could also clearly see the 20. In total, I’m pretty sure we spent a good hour moving around as a single large team. 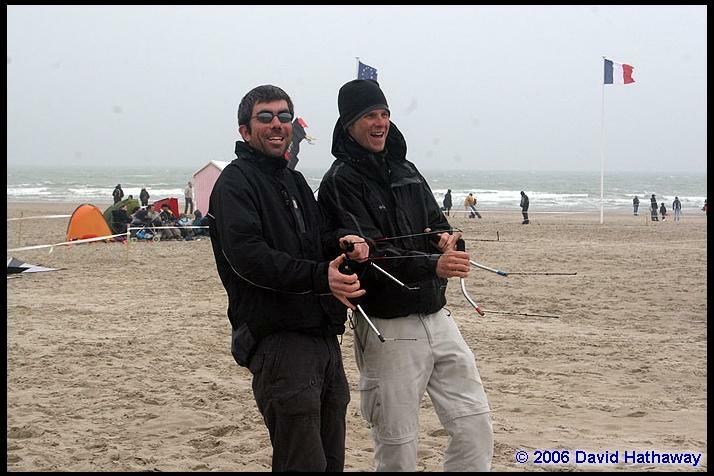 At this point, I’m pretty sure its record for the most quad kites involved in a team fly and its an experience I’d try again in half a heartbeat, the sheer rush and andrenaline that came with it was something I’ll never forget. 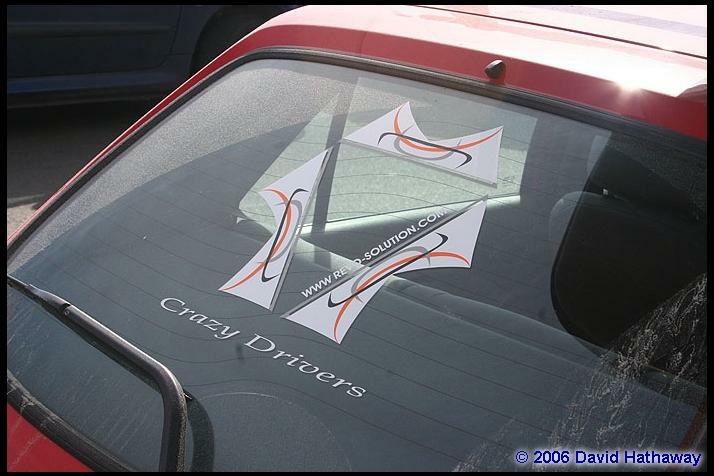 Most of this article has been about teams, however I’d like to get a quick mention of one phenomenal flyer I met while I was there, Fabrice Boldan of Crazy Drivers. With the craziest bridle ever seen on a Revolution, custom handles and amazing style this guy’s flying truly amazed me. 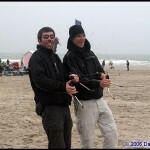 His ability to flic-flac anywhere in the wind window amazed many of us, and he was another person who if he was down on the beach, he was flying his heart out, also in the night fly. I’ve listed his website below where you can also see some videos of his great indoor flying. We couldn’t talk too much as his English was about as good as my French, but, again, another person I learned a lot from, simply by watching him fly. Nice work, Fabrice! 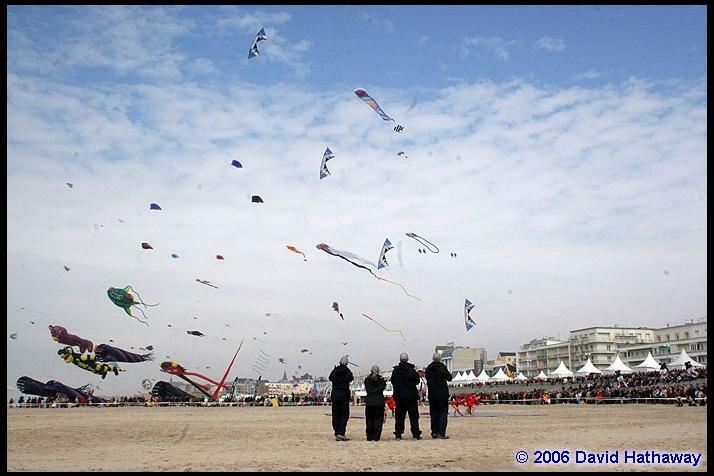 While the “big” kite fests in North America are something to be experienced, ie, Grand Haven, Wildwood and WSIKF, you really should make a trip over to one of the big European festivals and I can heartily recommend Berck as an excellent one to go to. I’ve never seen such a large and wildly talented bunch of quad flyers in my life and you can be sure that I will one day return to that magical place. I’d like to take this spot to deeply thank FLIC, Team 4 Fun, Crazy Drivers and The Flying Squad ( and anyone else I met and flew with! ) for helping to make my trip such a memorable one. And the best thing of all? I came back from France a –much- stronger flyer than when I left, after having spent so much time flying with slowness and precision. John and I were so bowled over by the experience that we have vowed to build our own team to fly with, and work for that is now well underway. 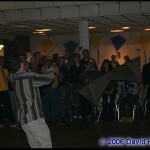 We’ll tell you more about iQuad as we get it together and I’m definitely starting to make plans for a return to Europe. Au Revoir for now and may the winds be at your back. 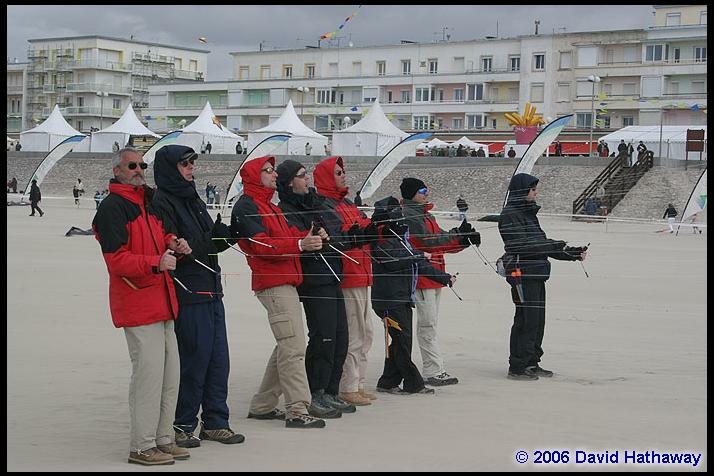 This entry was posted in 2006, General Topics, Indoor Kiting, Issue 48 (May/Jun), Kite Columns, KL Archive, Quad Line and tagged crazy drivers, flic, rev, revolution, team 4 fun, the flying squad.